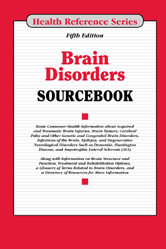 Brain Disorders Sourcebook, Fifth Edition provides readers with updated information about brain function, neurological emergencies such as a brain attack (stroke) or seizure, and symptoms of brain disorders. It describes the diagnosis, treatment, and rehabilitation therapies for genetic and congenital brain disorders, brain infections, brain tumors, seizures, traumatic brain injuries, and degenerative neurological disorders such as Alzheimer disease and other dementias, Parkinson disease, and amyotrophic lateral sclerosis (ALS). Section 31.1— What Is Traumatic Brain Injury (TBI)? Section 52.1— What Is Epilepsy?